Just beautiful. The Taj Mahal aint bad either!! So, our train journey to Agra. It wasn't pretty. Think of squashed sardines in a tin can and you still won't be close! As our train arrived on the platform there were already bodies hanging out of the doors. Somehow we managed to find a slightly emptier doorway to step onto but the conductor chased us off as it was outside the air conditioned upper class! At one point we were forced to stand in the boiling hot kitchen! With no air con or fan's to cool the place with the big hot frying pans cooking food for the whole train. But it got worse ... we got caught in the middle of a barny between an indian guy and the kitchen staff, it was a big royal rumble with bodies and fists flying everywhere! 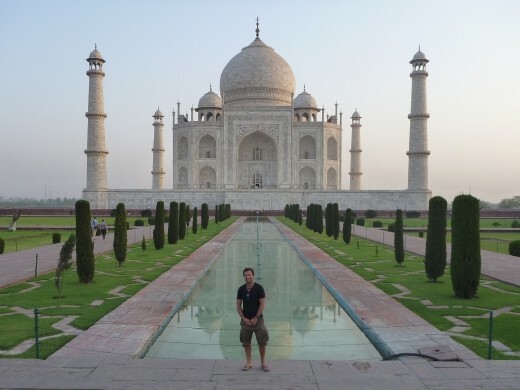 We arrived in Agra that evening and found ourselves a place to stay in walking distance to the Taj Mahal. After checking in we went straight upstairs to the roof top terrace were we caught our first glimpse of the Taj. It was at night time but the full moon lit the sky enough to get a decent look. The next morning we got up a 5a.m to watch the sunrise over the Taj Mahal. Wow what an experience! At 750 rupees entrance fee it was a bit pricey but well worth it! It really is the most amazingly beautiful building! Perfectly symetrical. Later on in the afternoon we booked our train tickets to our final destination in India, the holy city of Varanasi and the river Ganges. Before we left we took a cycle rickshaw and explored the impressive Agra Fort. 3 trains through the night and we arrived in Varanasi. We stayed at Mishra guest house that had free wifi and was a 2 minute walk from the river Ganges. For those who do not know, Varanasi and the ganges attract devout hindu's from all over India. Bodies of the dead are burnt to ashes on the fire's next to the ganges and some bodies, that are considered wholy, are taken straight out to the ganges and dropped in attached to weights. Anyway, on our first close encounter we were taken aback with what we saw. Our pete noticed a dog had found some food at the riverbank. As the dog chewed and dragged this food out of the ganges it became clear that it was part of a torso with 2 legs attached. Even more disturbing were the people swimming and washing in he ganges less than 15 metres from where this dog was eating his dinner! That evening we took a boat trip on the ganges for sunset. It was great watching the local people go about their daily business praying and washing in the ganges. We were up early the next morning for another boat trip in time for sunrise. In the afternoon we took a walk along the ganges and watched all the local children playing cricket. Every 50 metres or so there was another game going on with another gang of kids! We found Varanasi interesting with loads of history but it's not a place we would rush back to. So, there you go. 6 weeks in India done and dusted! If I could sum it up in a few words it would be ... Friendly people, sensational food, great beaches, amazing buildings and so so so cheap! Next stop ... Nepal and the mighty Mount Everest!